The clean classic lines of this pool blend seamlessly with the architecture and garden to create a cohesive landscape at this estate. 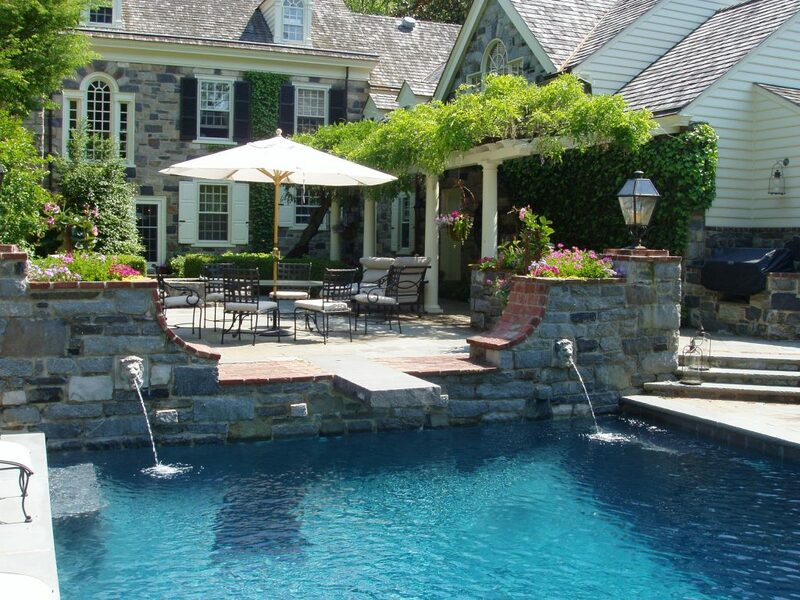 The state of the art pool was given old world charm by adding whimsical fountains and stone details to keep in line with the tone of the residence. As the heat of summer slowly gives way to cooler days, many are left yearning for the height of the season, when lazy days were spent lounging poolside. For those without pools, but in want of one for the following summer, or those who just want a pool refresh, fall is the perfect time to begin the planning process. By planning that far ahead, homeowners are able to take advantage of the still-warm weather to survey their spaces, work with architects and designers on what they want from the space, and ultimately seek permitting that will allow a pool to be built in time for the first heat wave next year. To make those dreams a reality, the experts at Chadds Ford-based Wallace Landscape Associates can help. With many years of experience producing award-winning work, they know how to transform a space and make dreams of a pool a reality. 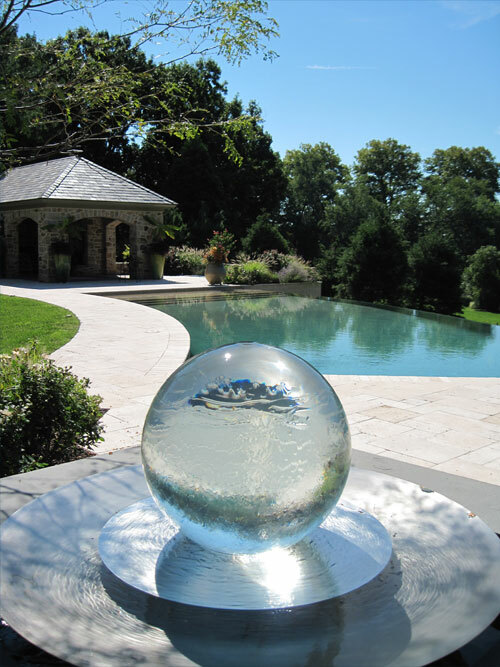 For many Main Line homeowners, a pool is the perfect complement to their landscape. 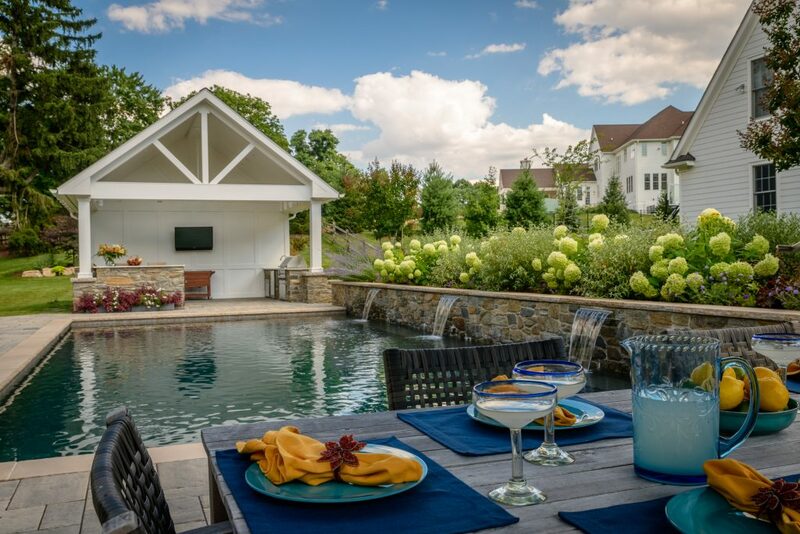 Rather than spending the entire summer at the shore, or eschewing time outdoors on weekdays because of the heat, homeowners can retreat to their own backyard oases to cool down and relax. Since many estates in the region are historic or designed with historic elements in mind, a modern pool can feel jarring. Wallace knows how to maintain the charm and history of a property while incorporating a pool. “A lot of work we build is trying to tie into the historic East Coast landscapes and architecture,” says Richard Lyon, principal landscape architect at Wallace. To do so, they use materials that closely match those incorporated elsewhere, like stone on a home’s façade or in the landscaping, ensuring the look is consistent and aesthetically pleasing. 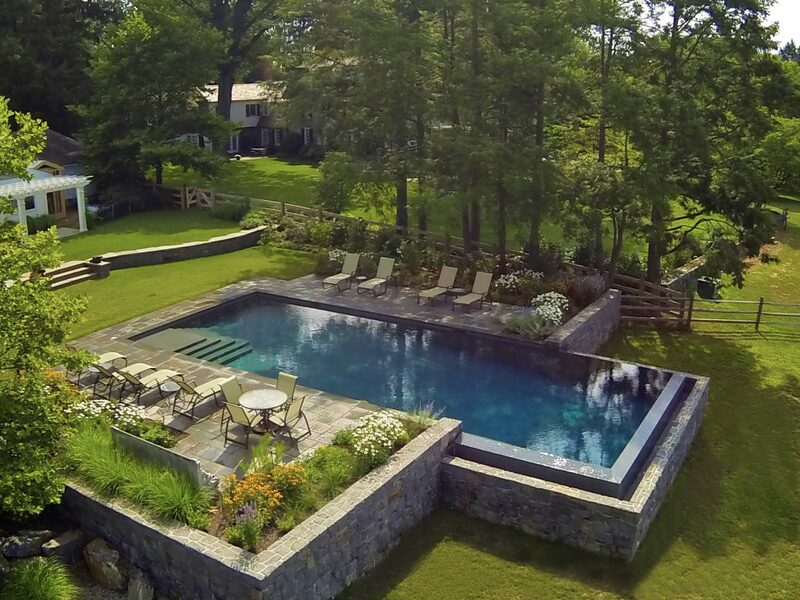 This vanishing edge pool was nestled into the hillside and positioned to take advantage of the beautiful bucolic setting of the horse pasture. This luxurious pool was crafted from local materials and incorporates progressive details. Pools were once used exclusively for swimming and lounging. Today, pools serve a much greater purpose. They’re often show-stopping centerpieces in the backyard and can have myriad elements to increase their soothing nature and aesthetics. To capitalize on their soothing qualities, many homeowners opt for water elements, which both look beautiful and offer a tranquil sound. Among the options are waterfalls, water jets and even spas. Other commonly incorporated elements include sun shelves, which allow homeowners to lounge in the pool without actually being in the water. No matter what the element, it’s always beautiful and functional. “The backyard’s the sanctuary oasis. One of the key things behind that are the functional elements that make the sensory elements working,” says Lyon. This pool was skillfully carved into the existing hillside to create a dramatic multi-level outdoor entertainment space. Accent lighting highlights the stonework and creates spectacular views to the pool throughout the seasons. 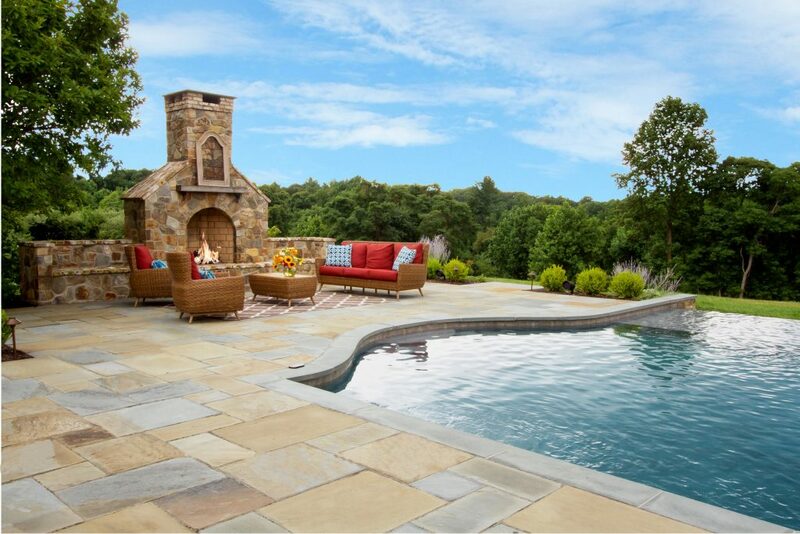 The stone fireplace and attached stone seating wall complement the geometric lines and bluestone paving of this Mediterranean style inspired pool. The pool season is extended with an outdoor fireplace and heated pool. For those who want to exercise in their pools, the shape might be different than for those who imagine their pool being used more for entertaining. 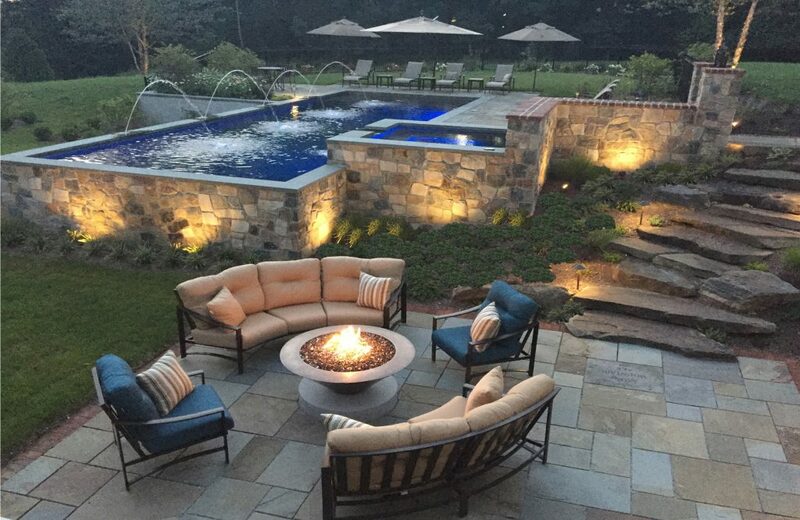 Pools come in a range of shapes and sizes and with the help of a professional, can easily encompass other outdoor living elements, like dining areas, kitchens, fireplaces or pits, and pool houses, ensuring connectedness. Infinity pools are becoming increasingly popular as well, for their modern, seamless looks. Its location overlooking the Delaware Bay treats swimmers to a prime vantage point. Using travertine pavers comfortable seating areas flank the pool allowing visitors to enjoy the ocean views. One of the best parts of living in the Brandywine Valley is its rolling green hills, many replete with horses and woods. While they are utterly bucolic, those hills can be tricky when it comes to building. Based in the heart of the Brandywine Valley, Wallace Landscape Associates can easily manage those trickier properties, working with homeowners to determine the best options for their space. That means taking into consideration the topography, the type of pool and elements an owner wants, and how they want it oriented in relation to the property and the sun. Some prefer pools that bask in the glow of the sun all day long, while others like a bit more shade for their lounging areas, all factors Wallace takes into consideration when designing a pool, especially when there are hills involved. Another important factor is proximity to the home, especially for those who want year-round use out of their pool. 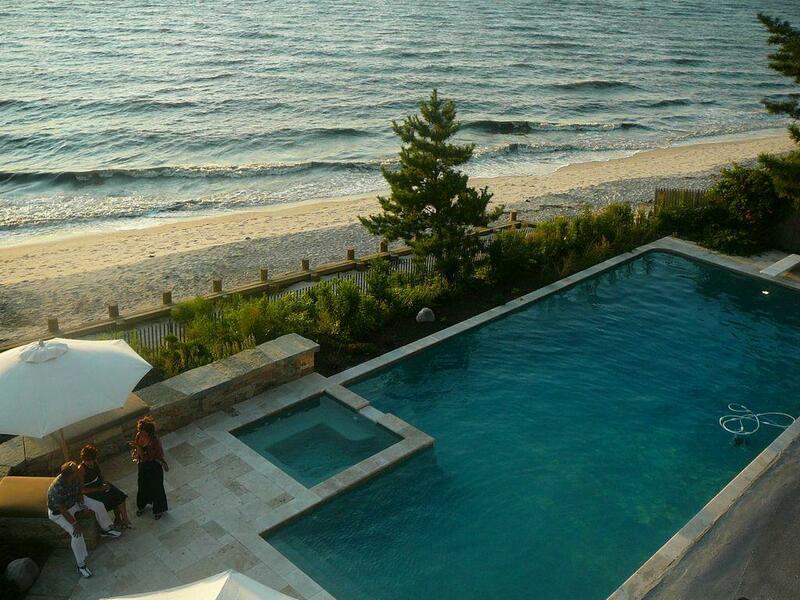 For those with shore or beach homes, Wallace can also tackle sandy properties, ensuring the flow is seamless. They can even add a beach entry, allowing for easy access from one oasis to the next. Regardless of the property, nobody wants to obscure the beautiful views around the pool, whether that’s a sun-dappled wood where deer frolic, or open golden fields in the distance. By using a landscape architect, homeowners can ensure they’ll never sacrifice their views. With any pool, safety is a key factor in the design, especially when homeowners have children or pets. Because of their expertise in landscaping, Wallace is able to incorporate fencing, pool covers and other safety features, without taking away from the aesthetics. A charming Wayne home has the ideal outdoor space for entertaining friends. A custom-built pavilion with built-in BBQ, sink, refrigerator and a granite-topped bar and seating are the extras that turn the pool area into an oasis. Even though summer has ended, it’s never too soon to start looking ahead to next season and the joy that can be had poolside. Take the stress out of designing a pool and leave the work to the experts. Wallace Landscape Associates ensures that everything is perfect, so that when the season rolls around, you can sit back, relax and soak up the sun.